“I would start by saying that the protest was twofold. 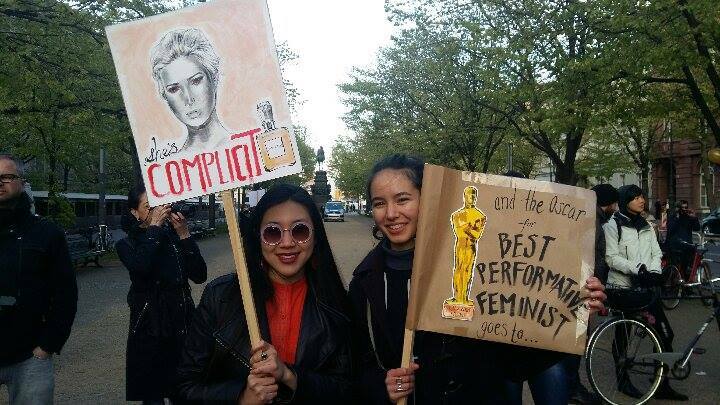 Firstly, we protested Ivanka Trump visiting Berlin as an official representative of the United States: Her presence represents perfectly the hypocrisy and nepotism of the Trump administration. Secondly, we were protesting the event that was the context for her visit: the Women 20 Summit.” Julia Damphouse (HAST, BA2), one of the organizers of the Gala für Alle — a protest I was also a part of — explains about a month after the event. Organized by The Coalition Berlin — a broad-based group of (left-wing) organizations and individuals from Berlin whose goal is to fight the recent rise of right-wing extremism — the Gala für Alle took place near Branderburger Tor on the 25th of April in front of the Deutsche Bank Kunsthalle, which hosted the W20 summit. This event wasn’t simply a protest in the classical sense, but it included music to which people could dance and live performances. In addition to the festive aspect, this street party was certainly able to also make its demands heard through signs, chants and speeches. This article will be a late reflection on the Gala, whose relevance persists, and will think about how we might approach events such as these in the future as neither Ivanka nor the G20 are going anywhere any time soon. “This is what democracy looks like, that is what hypocrisy looks like!” Shouted the protesters. 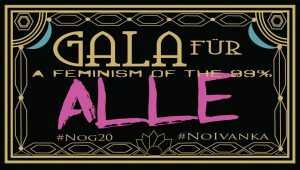 In contrast to the photographs of the W20 summit, which showed mostly white and wealthy women dressed in business attire, our Gala was the antithesis of that exclusivity. Instead of champagne and expensive catering, beer and snacks were provided by the organizers and provided freely to all the participants. However, most chose to reimburse the activists providing the beverages out of solidarity. The dress code, comically classified as “decadent”, saw a variety of interpretations ranging from pink high-heels to black-tie getups to roller-skates to flower-crowns to gender-bending. 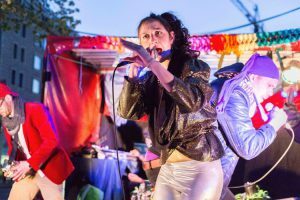 The activists, artists, and entertainers all spoke and performed on a stage set up at the back of a red truck which had the words “Party Time” decorated with rainbow streamers attached right above the stage. Even our very own professor Paul Festa played the violin on this stage. Other acts included poetry readings as well as saxophone, rap, and drag performances. Our politicized party was so good that the police that were securing the protest even changed their position in order to watch the show. “Looks like our Gala is better,” joked Oly Stash, the MC who coordinated the program and led most of the chants. 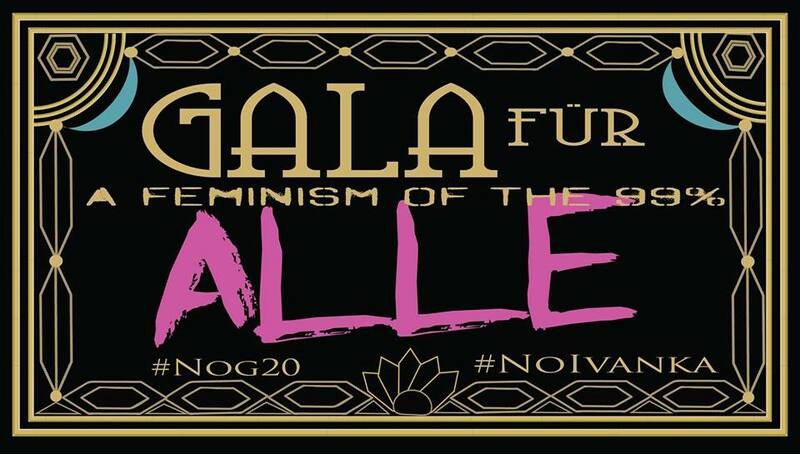 Unlike the W20, the Gala für Alle hosted feminists who were Ivanka’s polar opposites. Activist Veslemøy Holseter read Elisa Chavez’s feminist, anti-Trump poem “Revenge” with lines that scream of intersectionality: “I’ll give birth to an army of mixed-race babies/ With fathers from every continent and genders to outnumber the stars.” Polish activist Anna Krenz spoke about the nearly nonexistent abortion rights and the jarring reality of the right-wing regime in Poland that is led by female prime-minister Beata Szydło. Certainly, Ivanka Trump is not the only henchwoman of fascism, as one protester’s sign called her. 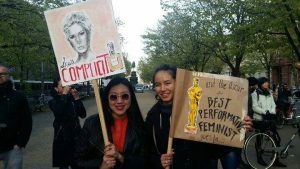 Many signs and chants criticized and mocked Ivanka: one called her “Ughvanka”, another referenced SNL’s Scarlett Johansson skit that accused Ivanka of being complicit with her father’s policies, and one provided her with the definition of the word “complicit.” The chants we shouted were really creative and to the point, such as “Your feminism’s fake, you only care how much you make” and “Banker, wanker.” However, my personal favorite would have to be “Champagne, caviar, Ivanka’s life is really hard” said in a mocking, crying voice. Since Ivanka is a symbol for the nepotism, bigotry and corruption of the Trump administration, the sharpness of the signs and chants was warranted to speak truth to power. I believe that the protest was successful as it managed to not only be inclusive but to tackle a myriad of issues. 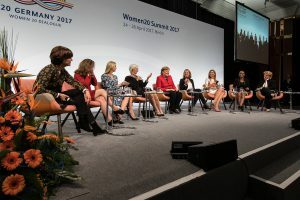 Activists reminded Angela Merkel, who sat alongside Ivanka at the W20 summit, that they will not stand for her deportations of Afghan people residing in Germany as their homeland is far too unsafe for them to be sent back. Perhaps the most important speech of the event was one concerning the Dakota Access Pipeline (DAPL) and one of its key investors, Deutsche Bank. Activist Karin Louise Hermes spoke about how the DAPL is not only infringing on the indigenous land rights of Native Americans, but how it is detrimental to the environment, using the unsustainable and polluting energy source of oil as well as having leaked before even becoming fully operational — just as indigenous activists had feared it would. Louise called for Deutsche Bank to divest from the project and expressed her support for the indigenous people of Standing Rock who oppose the pipeline that is, unjustly, already running through their sacred land. It is imperative that we bring environmental issues into our activist discourse: Trump’s recent withdrawal from the Paris Climate Accord demonstrates how fossil fuel related Executive decisions will not stop coming. But demonstrations of solidarity weren’t only delivered in speech form. Two performances stuck out to me: the Tsootsies and Nicolás Miquea. The Tsootsies performed German rap. Since most of the people attending the protest were international residents in Berlin, it was a little funny that they had to ask people living in the German capital whether they spoke the language they performed in. Even though the lyrics of their songs weren’t accessible to everybody, their performance was dynamic and felt to be in the spirit of dissent. Their music also made people dance, truly turning the Gala into a party. But the thing that stuck with me the most from their act was how one of their members made a joke about her gold-colored jacket, stating that “nothing is more decadent than gold” to draw the protest back to its core complaints. Miquea’s performance took a different tone. Using only an acoustic guitar and his voice, Miquea performed songs in Spanish to which he gave a heartbreaking introduction. 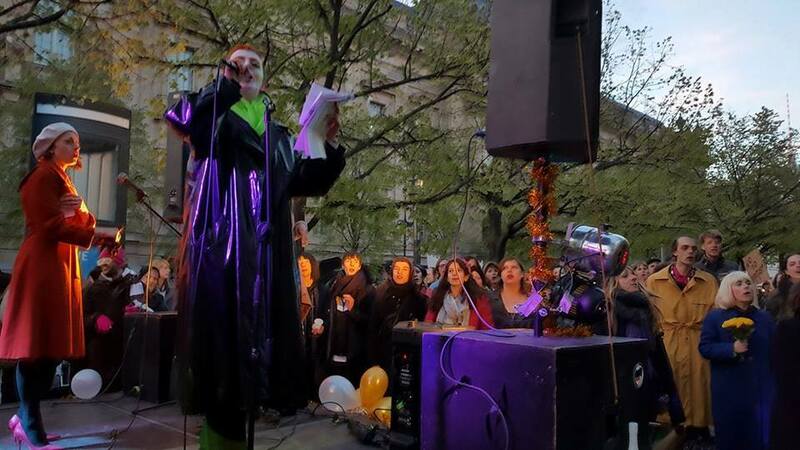 The Chilean musician pointed out that his art focused on themes of colonialism and imperialism, saying “I’m sorry to ruin everyone’s good mood, but I only write sad and angry songs” and “you should never trust an imperialist when he speaks of peace,” referring to the US. After his act an American that I was with said to me that she was surprised to hear that the US had been considered imperialist and that she wasn’t used to hearing the US being talked about as the “bad guy” – statements that were a part of Miquea’s message that would be much more apparent to non-Americans, especially the ones negatively affected by faulty US foreign policy. I mention this not to bash her but simply to point to how American nationalism and exceptionalism are not ideologies exclusive to the Trump administration but are rather part of a much larger national narrative that has made even well-intentioned citizens ignorant of their country’s far from perfect past and present. Her reaction serves as proof of the relevance of and need for events such as the Gala für Alle. Though the Gala itself took place over a month and a half ago, the more time I have spent with this piece, the more apparent it has become to me that it still holds importance. I would love it if, after having alliterative signs reading “No to Nepotism” and shouting “Ivanka, Ivanka, we don’t really want ya!”, Ivanka would actually pack her bags, leave the White House, and go back to Trump Tower. But, sadly, the resistance against right-wing politics and real feminism that helps the majority require much more. Wealthy women often try to frame their business success as some kind of revolutionary anti-patriarchal fact, while neglecting to acknowledge their (white) privilege, and how their success was probably built on the backs of working women (of color), making their feminism elitist at best, and exploitative at worst. While the gender pay gap exists in virtually every country to various degrees, Dior profits from selling supposedly activist $710 white T-Shirts that read “We Should All be Feminist” under the excuse that “a percentage of proceeds from the sale of each shirt will benefit The Clara Lionel Foundation” i.e. Dior will still be making significant financial gains by commodifying feminism. While Latina women get paid 54 cents on a white man’s dollar, “House of Cards” actress Robin Wright complains and cries sexism about getting paid a mere 420 thousand dollars per episode (!) as opposed to Kevin Spacey’s half a million when she herself admits that her character has less scenes — Wright asks for equal pay for unequal work and somehow wants us to believe that she, a rich white woman, is the victim of the same sexism that working class women experience everyday. While her father and the Republican Party attempt to defund Planned Parenthood, Ivanka tries to sell any business act she makes as a feminist act solely because she is a woman in business, regardless of the consequences her actions have on (women) workers. We cannot perceive these acts as feminist and we cannot allow these (wealthy) women to sell them to us as such. Not only does this feminism not effectively fight the likes of Trump, but it may even aid governments such as his. While white women like Ivanka, Betsy Devos and Kellyanne Conway still seem to have a place in right-wing regimes, women (and other people) of color have their humanity questioned and denied. It is not to say that wealthy women necessarily have no place in feminism: indeed, they can use their platforms to bring attention to bigger issues. However, a feminism that concerns itself with the percentage of female CEOs of Fortune 500 companies and number of female billionaires is essentially useless. Getting women to the big boy table does deny the existence of the big boy table. In other words, if the system remains the same, except now the Ivankas of the world can oppress people of color and exploit cheap (female) labour to make their profits alongside the Donalds, then no substantial change has been made. Feminism of the 1% simply will not do. Instead, we must opt out for a feminism that serves the 99%: the working mothers, the indebted college students, the immigrant workers, the queer and trans* women. We must advocate for a feminism that is class conscious, and dare I say, socialist.